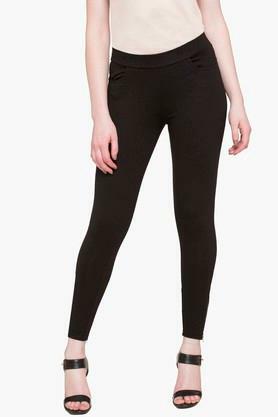 Femina Flaunt presents this pair of leggings, which will be a great pick for all the fashionable women of today. It comes with an elasticised waistband that ensures a snug fit, while the solid pattern gives it a trendy look. It will also keep you comfortable as it has been made of a supreme quality fabric. Look fashionable by wearing this pair of leggings, which has been designed with precision. Suitable for any casual occasion, it will go well with different types of tunics and kurtas.